3-room apartment 75 m2, on the ground floor. Fully renovated in 2014, beautiful furnishings: living/dining room with 1 double sofabed and satellite TV. Exit to the garden, to the terrace. 1 double bedroom with shower/WC and air conditioning. 1 room with 1 french bed (1 x 120 cm), shower/WC and air conditioning. Kitchenette (4 hot plates, oven, electric coffee machine). Heating, air-conditioning (extra). Small garden. Terrace furniture, deck chairs. Very beautiful panoramic view of the swimming pool, the garden and the countryside. Facilities: baby cot for up to 2 year olds. Please note: private entrance. 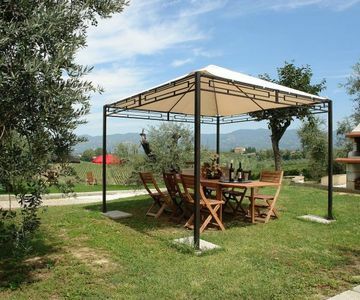 Beautiful residence "Agriturismo di Vinci", renovated, surrounded by meadows, fields and vineyards. 4 km from the centre of Vinci, in a quiet, sunny position on top of a hill, in the countryside. For shared use: property 20 ha, large garden lawn and trees, lawn for sunbathing, natural pond, swimming pool (6 x 12 m, depth 150 - 150 cm, 22.04.-14.10.). Outdoor shower, table tennis, patio, terrace, garden furniture, barbecue. In the complex: reception, lounge with TV, internet access, washing machine (for shared use, extra), bicycles available (extra). Linen change weekly. Parking on the premises. Shop 2 km, supermarket 4 km, restaurant 2 km, railway station "Empoli" 9 km, sandy beach "Versilia" 60 km. Golf course 5 km. Nearby attractions: Lucca 40 km, Firenze 42 km, Thermalbad Montecatini Terme 22 km. Please note: fishing [permit required]. Local sale of farm products. Residence with electric gates. Property ref. it5220.36.1-4 is situated on the same property. All houses/apartments are individually designed/furnished.